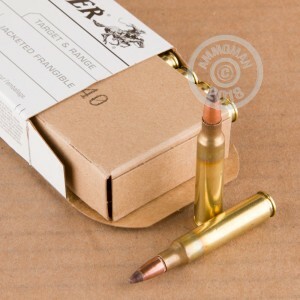 Whether you're conducting rigorous tactical training or simply shooting steel targets with your AR-15, frangible ammunition is a must-have. 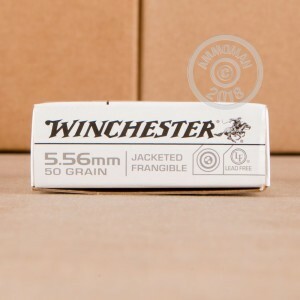 These 5.56 NATO cartridges from Winchester fire a jacketed frangible projectile that breaks apart on contact with hard surfaces, minimizing the risk of ricochets. 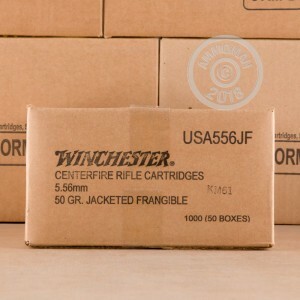 Each cartridge in this 20-round box fires a 50 grain bullet at a muzzle velocity of 3,000 feet per second. The bullet design features an outer brass jacket with an exposed core of frangible material.